11th 4x400m Open Men Relay (G.Haasbroek, C.Yorke, D.Paull, M.Chimenton). Silver U/12 Vic All Schools 800m - H.Anderson. Bronze U/12 Vic All Schools 1500m - H.Anderson. 6th - Pacific School Games U/11 Boys - H.Anderson. 15th - Pacific School Games U/11 Boys - H.Anderson. 6th - Victorian Championship Boys U/18 100m - N.Antonino. 4th - Victorian Championships Boys U/18 200m - N.Antonino. Victorian LA Championship U/11 400m - B.
Victorian LA Championship U/11 1500m - B. Gold - World Masters 40+ 400m Hurdles - C.Yorke. Silver - World Masters 40+ 400m - C.Yorke. Gold - World Masters 40+ 4x400m Relay - C.Yorke. 7th - Victorian Championships 100m U/20 Boys - H.Kerr. 4th - Victorian Open Championships 400m Hurdles - C.Yorke. Silver - Medley Men's Open Victorian Relay Championship - N.Repalust, D.Richardson, D.Paull, T.Norton. 5th - 4x100m Women's Open Victorian Relay Championship - K.Moore, D.Shaw, J.Payne, S.Fitt. 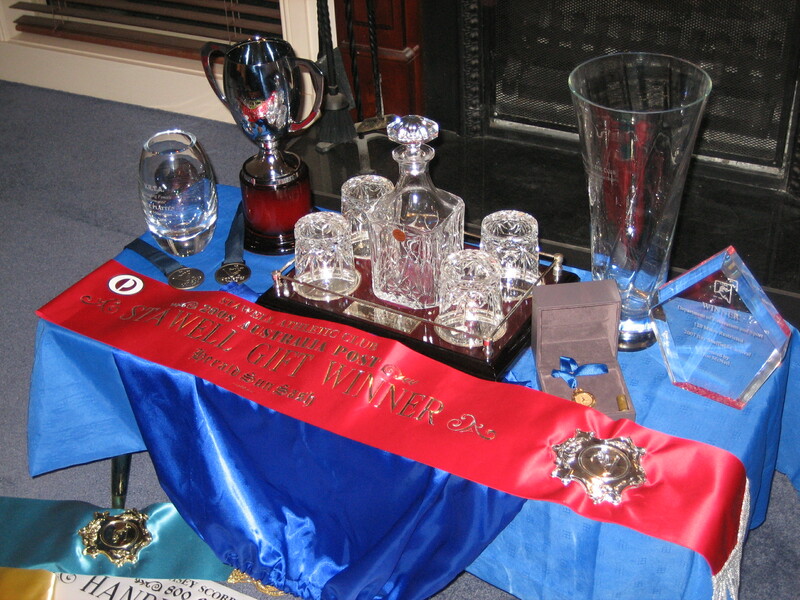 4th - Medley Women's Open Victorian Relay Championship - D.Shaw, J.Payne, K.Moore, C.Cosgriff. Silver - 4x100m Boys u/18 Victorian Relay Championship - N.Repalust, D.Richardson, J.Lacey, G.Haasbrook. 4th - 4x400m Boys U/18 Victorian Relay Championship - G.Haasbrook, L.Barrett, J.Lacey, S.Dang. 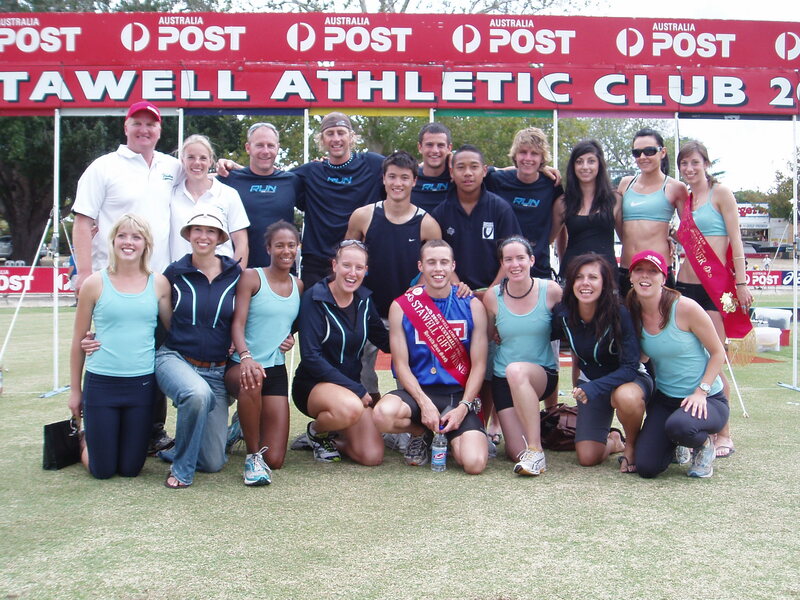 Gold - Victorian Knockout Open Pole Vault Women - N.McDowell. Gold - Oceania Championships (Cook Islands) U/20 4x400m (Maddy Scott, Jessica Haigh, Kasey Moore, Grace Victor). Silver - National University Games - Women's Pole Vault (Natasha McDowell). 7th - Vic All Schools u/18 100m (Brendon Glidden-Green). 5th - Vic Open Relays - Women's 4x400m (J.Payne, A.Platten, C.Cosgriff, K.Hubbard). 3rd - E.Ware (VRTA 200m Gift), C.Yorke (Warragul 550m), A.Platten (Warragul 400m Women's), C.Cosgriff (Bay Sheffield 550m Women's), C.Cosgriff (Devonport 1600m Women's), C.Morehouse (Burnie 120m Gift), C.Cosgriff (Rye 120m Women's), B.Glidden-Green (Rye 70m Novice), Kasey Moore (St Albans 300m Women), E.Ware (Avondale Heights 70m Don Furness), C.Moss (Ballarat u/20 70m), N.McDowell (Ballarat 120m Novice), C.Anderson (Ballarat 800m Frontmarkers), S.Jamieson (Ballarat 120m Gift), K.Moore (Trinity 50m Skins), A.Platten (Bendigo 120m Women), A.Platten (Bendigo 400m Women), Cassie Anderson (Ringwood 100m Women's), C.Cosgriff (Stawell 800m Women's), N.McDowell (Stawell 120m u/20), Sam Jamieson (Stawell 120m Gift). Silver - Victorian Open Women's Medley - (K.Hubbard, K.Moore, Kasey Moore, A.Platten). 8th - Victorian Open Women's Medley - (H.Atkins, A.Benifer, N.McDowell, C.Cosgriff). Silver - Victorian Open Women's 4x100m - (D.Shaw, K.Hubbard, K.Moore, A.Vine). Bronze - Victorian Open Women's 4x400m - (Kasey Moore, C.Cosgriff, K.Hubbard, A.Platten). 8th - Victorian Open Women's 4x100m - (H.Atkins, A.Benifer, N.McDowell, J.Payne). 4th - Victorian Open Women's 4x800m - (A.Vine, S.McDade, K.Moore, A.Benifer). 5th - Victorian Open Men's 4x800m - (T.Norton, D.Tromp, C.Yorke, B.Gliden-Green). 7th - Victorian Open Men's 4x100m - (J.Tiu, E.Ware, C.Yorke, M.Lacey). 3rd - Victorian Open Men's Medley - (J.Tiu, E.Ware, C.Yorke, T.Norton). Gold - Victorian Open Men's 4x100m - (C.Morehouse with Sandringham). Bronze - World Surf Life Saving Championships - Sprint Relay (H.Atkins). Gold - Victorian Open Womens Medley Relay - Kasey Moore, Kendra Hubbard, Katie Moore, Alice Platten. Silver - VIctorian Open Womens 4x100m Relay - N.McDowell, Katie Moore, K.Hubbard, A.Platten. 8th - Victorian Open Mens 4x100m Relay - E.Ware, J.Tiu, M.Shiel, C.Foley. 6th - Victorian Open Mens 4x400m Relay - C.Morehouse. 5th Zatopek 100 yards men - C.Morehouse. 5th Zatopek 100 yards women - Kendra Hubbard. Gold - Australian All Schools U18 Womens 400m Hurdles - Kasey Moore. Silver - Youth Olympic Festival - 400m Hurdles - Kasey Moore. 5th - Victorian U/20 Womens Pole Vault - Natasha McDowell. 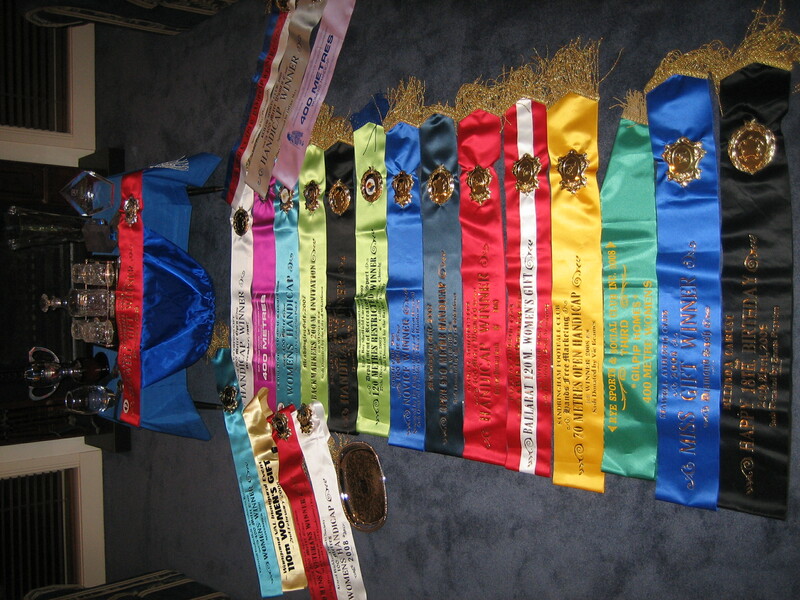 8th - Australian Surf Flags - H.Atkins. Bronze - Australian Open 200m Women Championships - K.Hubbard (2nd Australian). 5th - Australian Open 100m Women Championships - K.Hubbard (4th Australian). 5th - Australian Open 800m Women Championships - A.Platten (4th Australian). 5th - National U/16 Girls 200m Hurdles Championship - Kasey Moore. Silver - ACT - 100m Womens Championship - K.Hubbard. Gold - Queensland 800m Ambulant State Championship - I.Speed. 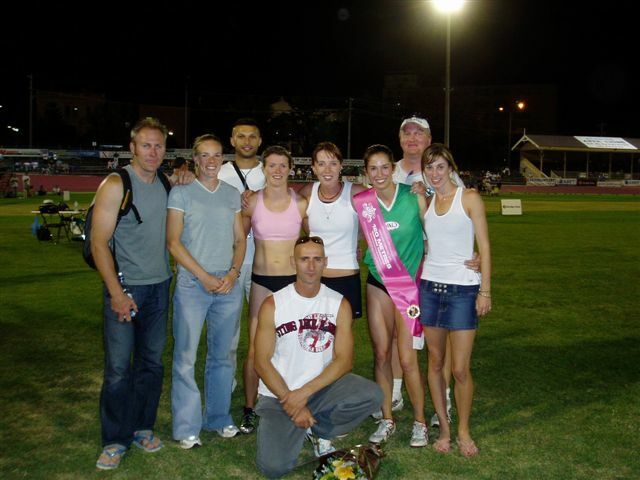 3rd Zatopek National Series Womens 800m - A.Platten. 3rd Zatopek National Series IPC Ambulant Mens 800m - I.Speed. 8th Brisbane National Series 100m Women - K.Hubbard. 6th Brisbane National Series 800m Women - A.Platten. 4th Newcastle National Series 100m Women - K.Hubbard. Silver - 120m Womens Australian Championship - K.Hubbard. Silver - Victorian Open 4x100m Mens Relay - (J.Tiu, S.Law, C.Yorke, C.Foley). Silver - Victorian Open Medley Mens Relay - (T.Fawthorpe, C.Yorke, J.Tiu, S.Law). 1st Little Aths Peninsula 120m - D.Moore. Silver - WA State 100m Open Championships - A.Mott. Silver - WA State 200m Open Championships - A.Mott. Gold - Open Mens 400m Hurdles - C.Yorke. Silver - Open Mens 100m - A.Mott. Bronze - Open Womens 200m - K.Moore. 4th - Open Womens 200m - K,Hubbard. 4th - Open Womens 100m - K,Moore. Finalst (Did not start) - Open Womens 100m - K.Hubbard. 5th - Open Womens 800m - A.Platten. 5th - Open Womens 400m - A.Platten. Silver - Junior Victorian Championships 200m Hurdles - Kasey Moore. Silver - Open Mens Medley (Ringwood - T.Norton, C.Yorke, J.Tiu, S.Law). Silver - Open Mens 4x100m (Essendon - A.Mott, ?, ?, ?). Bronze Open Mens 4 x100m (Ringwood - J.Tiu, S.Law, C.Yorke, D.Rowland). Silver Open Womens Medley (Ringwood - K.Moore, C.White, K.Hubbard, A.Platten). Silver Open Womens 4x100m (Ringwood - K.Hubbard, K.Moore, A.Platten, C.White). Silver 300m Girls 300m Junior Hurdles - Kasey Moore. Kendra Hubbard (6th in 200m Final). Katie Moore (8th in 200m Final). Kasey Moore (8th Junior Nationals 200m Hurdles). 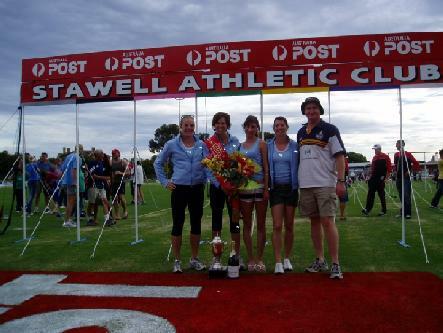 1st : A.Platten (VRTA Womens 200m), S.Law (Melbourne 120m Gift), K.Hubbard (Peninsula Open 70m), K.Moore (Peninsula 120m Womens), D.Naismith (Peninsula 400m Novice), K.Hubbard (Peninsula 400m Womens), A.Platten (Rye Open 800m), K.Moore (Rye 120m Womens Gift), A.Platten (Ringwood Womens 400m), D.Naismith (Wangaratta Open 800m), K.Moore (Keilor Open 70m), K.Hubbard (Lithgow 120m Womens Gift), K.Moore (Lithgow Womens 100m Backmarkers Invite), K.Hubbard (Euroa Open 70m), S.Law (Cranbourne Trios 70m), A.Platten (Cranbourne Trios Womens 400m), K.Hubbard (Burramine Womens/Vets 300m), B.Carusi (Stawell Fashions on the Field), D.Naismith (Stawell 550m), D.Naismith (Stawell 400m Frontmarkers), D.Naismith (Stawell Bruce Walker Memorial Sash). 2nd : K.Hubbard (Mt.Gambier Womens 120m), C.Cosgriff (Melbourne Womens 800m), S.Law (Peninsula 70m), T.Pike (Rye 70m Novice), K.Moore (Ringwood 70m), A.Platten (Ringwood Womens 800m), K.Hubbard (Keilor U21 120m), K.Hubbard (Keilor Open 70m), D.Naismith (Bendigo 800m), C.White (Burramine Womens 100m), K.Moore (Burramine Womens/Vets 300m), D.Naismith (Burramine Novice 400m), A.Platten (Stawell Womens 800m), K.Hubbard (Stawell Womens 120m), D.Naismith (Ballarat 800m Backmarkers), T.Pike (Ballarat Novice 120m), K.Hubbard (Ballarat 120m Womens Gift). 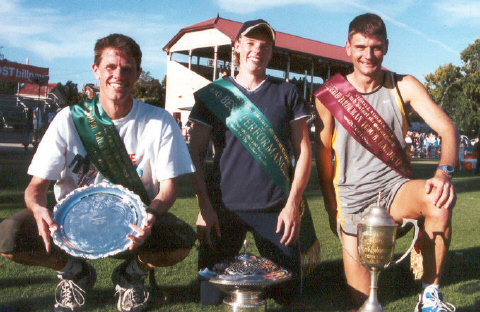 Bruce Walker Trophy (Best performance over 400m, 550m &800m at Stawell) - Darren Naismith. Australian Athletic Confederation ATtlete of the Year - Kendra Hubbard. VRTA Middle Distance Athlete of the Year - Darren Nasimith. VRTA Female Athlete of the Year - Kendra Hubbard. Gold 4x100m Mens Open Relay - J.Tiu, C.Dunbar, D.Greenough, N.Magree. Gold Medley Womens Relay - K.Hubbard, K.Moore, C.White, A.Platten. Silver 4x400m Womens Relay - K.Moore, K.Hubbard, C.White, A.Platten. Gold - U15 Boys 100m Luca Ranellone. 4th - Open Womens 200m - K.Hubbard. Bronze - Open Womens 100m - K.Moore. 6th - Open Womens 100m - K.Hubbard. 6th - Open Womens 800m - A.Platten. 8th (DNC) - Open Womens 400m - C.White. 9th (6th Australian) - Open Womens 100m - Kendra Hubbard. 10th (7th Australian) - Open Womens 100m - Katie Moore. 6th (4th Australian) - Open Womens 200m - Kendra Hubbard. 8th (6th Australian) - Open Womens 200m - Katie Moore. 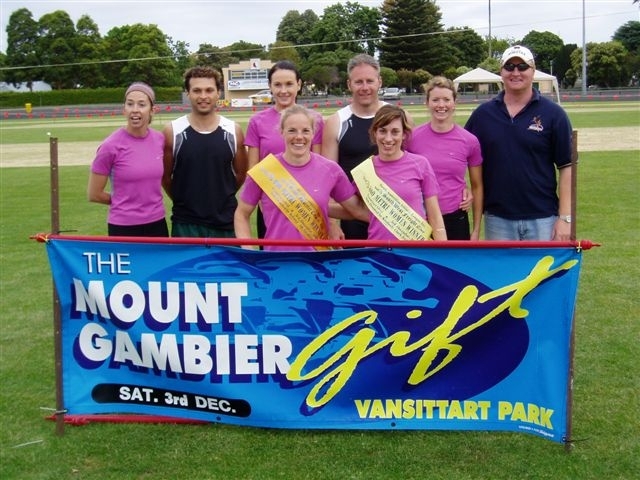 C.Cosgriff (VRTA Open 550m), C.Cosgriff (Mt.Gambier Womens 800m), K.Hubbard (Melbourne Open 120m Gift), K.Hubbard (Northcote Open 70m), M.Lacey (Northcote 400m Novice), A.Platten (Bay Sheffield Womens 550m), J.Tiu (Bay Sheffield U/20 120m), S.McKenzie (Rye 70m), C.Cosgriff (Rye Womens 400m), A.Platten (St. Albans Womens 120m), C.Cosgriff (Ballarat Frontmarkers 800m), C.Cosgriff (Keilor 120m Womens), C.Cosgriff (Burramine Womens 400m), B.Carusi (Stawell Fashions on the Field), M.Lacey (Stawell 400m Restricted Novice), M.Lacey (Stawell 400m Backmarkers). 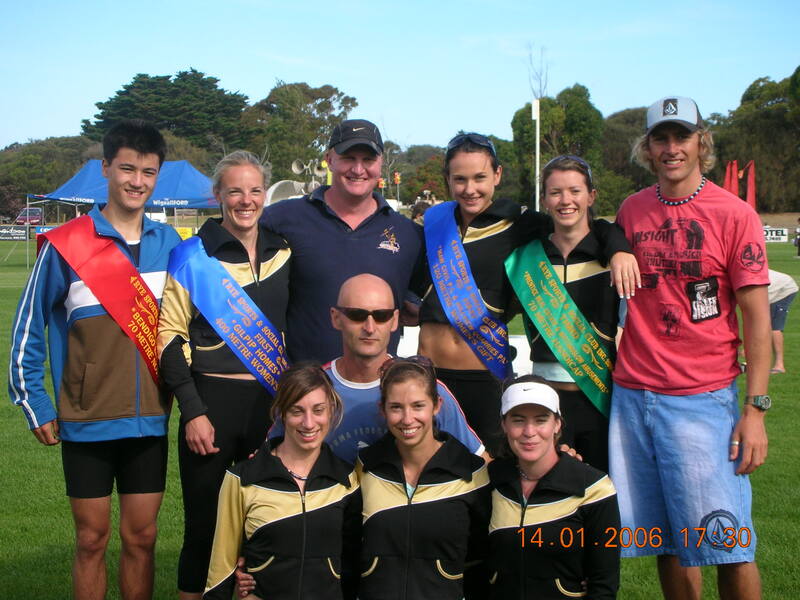 E.Poynton (Dandenong Womens/Veterans 300m), E.Poynton (Cranbourne Womens 400m), A.Platten (VRTA 550m Open), S.Mace (VRTA 200m Backmarkers Invite), C.Cosgriff (Casey 800m Open), J.Tiu (Bay Sheffield Restricted 120m), E.Poynton (Maryborough 400m Women), C.Cosgriff (Daylesford 400m Women), K.Hubbard (Ringwood 70m Novice), J.Tiu (Wangaratta 70m Open), A.Platten (Sandringham 70m Open), A.Platten (Ballarat Womens 120m), E.Poynton (Ararat 100m Women), E.Poynton (Keilor 400m Women), E.Poynton (Wanganui 110m Women), Sally Jamieson (Noble Park 100m Novice), Sally Jamieson (Bendigo 400m Women), E.Poynton (St.Bernards 300m Women), B.Carusi (Stawell Fashions on the Field), A.Platten (Stawell 400m Women), Sam Jamieson (Stawell 120m Gift) . 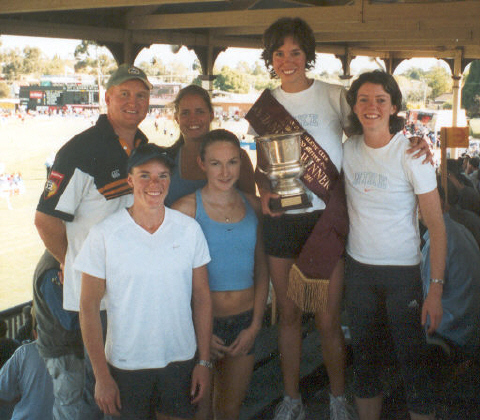 1st : K.Meagher (Whyalla Womens 120m), A.Platten (Queenbeyan Open 1000m), E.Poynton (Zatopek Open 400m), C.White (Devonport Womens 200m), S.Mace (Maryborough Novice 70m), S.Mace (Maryborough 120m Gift), C.Cosgriff (Rye 1600m Frontmarkers), E.Poynton (Ringwood Womens 100m), C.Cosgriff (Ringwood Womens 400m), C.White (Ringwood Open 400m Gift), J.Tiu (Keilor U/21 120m), A.Platten (Keilor Womens 800m), E.Poynton (Casey Womens 120m), C.Cosgriff (Bendigo Womens/Veterans 1600m), E.Poynton (Geelong Womens 100m). 3rd : E.Poynton (Cranbourne Womens 100m), C.Cosgriff (Maryborough Womens 400m), C.White (Maryborough Womens 120m), S.Mace (Ringwood Open 70m), S.Mace (Keilor Invitation 70m Skins). Other Finalists : E.Poynton (Dandenong Womens/Vets 300m), E.Poynton (Daylesford Womens 100m), K.Meagher (Daylesford Womens 100m), C.Cosgriff (VRTA Womens 400m), E.Poynton (VRTA Womens 400m), K.Moore (VRTA OPen 200m Gift), S.Mace (Rye 70m Open), C.Cosgriff (Rye Womens 400m), A.Platten (Rye Womens 400m), E.Poynton (Ringwood Womens 400m), A.Platten (Ringwood Womens 400m), A.Platten (Wangaratta Womens 400m), E.Poynton (Ballarat Frontmarkers 400m), A.Platten (Ballarat Frontmarkers 400m), E.Poynton (Ararat Womens 100m), E.Poynton (Ararat Womens/Veterans 300m), E.Poynton (Keilor Womens 120m), C.Cosgriff (Keilor Womens 400m), S.McKenzie (Keilor Invitation 70m Skins), J.Tiu (Casey 120m Gift), A.Platten (Bendigo Womens 120m), A.Platten (Bendigo Womens 400m), C.Cosgriff (Bendigo Womens 400m), E.Poynton (Bendigo Womens 400m), E.Poynton (Waverley Womens 100m), A.Platten (Waverley Open 400m), C.White (Geelong Womens 300m), C.Cosgriff (Geelong Womens 300m), C.Cosgriff (Stawell Womens 400m), J.Karambelas (Stawell Frontmarkers 400m), S.Mace (Stawell U/17 100m). Other : S.Mace (1st U/21 Epping), S.Mace (1st U/21 Northcote), J.Tiu (3rd U/21 Ballarat), J.Tiu (1st U/21 Burramine), S.Mace (2nd U/21 Geelong). 1st : A.Platten (Dandenong Womens 300m), T.Lewis (VRTA Womens 400m), A.Platten (Mt.Gambier Womens 800m), A.Fiedler (Mt.Gambier Womens 400m), K.Moore (Devonport Womens 200m), K.Moore (Burnie Womens 120m Gift), C.White (Burnie Womens 400m), C.White (Rye Womens 120m Gift), A.Fiedler (Rye Womens 400m), J.Tiu (Wangaratta Novice 120m), A.Platten (Wangaratta Open 800m), C.White (Wangaratta Womens 400m), C.White (Heidelberg Womens 400m), K.Meagher (Noble Park Open 70m). 2nd : A.Fiedler (Dandenong Womens 300m), A.Fiedler (VRTA Womens 400m), K.Moore (Mt.Gambier Womens 120m Gift), A.Platten (Mt.Gambier Womens 400m), T.Lewis (Geelong Womens 120m), K.Moore (Bay Sheffield Womens 120m Gift), C.White (Devonport Womens 400m Gift), A.Platten (Maryborough Womens/Vets 400m), J.Tiu (Rye 70m Novice), T.Lewis (Ringwood Womens 100m), A.Platten (Ballarat 400 Frontmarkers), C.White (Noble Park Womens 120m), A.Platten (Noble Park 400m), A.Platten (Burramine 400m Women). 3rd : K.Moore (VRTA Open 70m), C.White (VRTA Womens 400m), S.McKenzie (Bay Sheffield Backmarkers Invite 120m), C.White (Devonport Womens 200m), C.White (Hobart Womens 300m), K.Moore (Rye 70m Open), K.Moore (Ringwood 70m Open), A.Platten (Ringwood 800m Open), J.Tiu (Keilor U/21 120m), C.White (Burramine 100m Women), A.Fiedler (Burramine 400m Women). Other Finalists : A.Platten (VRTA Womens 400m), S.McKenzie (Mt.Gambier Open 70m and 120m), C.White (Mt.Gambier Womens 120m), K.Moore (Mt.Gambier Womens 400m). T.Lewis (Bay Sheffield Womens 120m Gift), A.Platten (Devonport Womens 400m Gift), A.Platten (Devonport Womens 200m), A.Fiedler (Devonport Womens 800m), C.White (Burnie Womens 120m Gift), J.Tiu (Maryborough 70m Novice), T.Lewis (Maryborough Womens 120m), A.Platten (Maryborough Womens 120m), A.Fiedler (Rye 800m Open), A.Platten (Rye 400m Womens), K.Meagher (Rye Womens 120m Gift), K.Moore (Rye Womens 120m Gift), K.Meagher (Ringwood 100m Womens), A.Fiedler (Wangaratta Open 800m), C.White (Wangaratta Open 70m), A.Platten (Sandringham 400m Womens), K.Meagher (Sandringham 400m Womens), K.Moore (Ballarat 70m Open), K.Meagher (Ballarat 120m Womens Gift), K.Meagher (Heidelberg 400m Womens), C.Cosgriff (Heidelberg 400m Womens), C.White (Noble Park 70m).